Do you have a teenager in the house who just started driving? It is extremely scary for the parents of the teen, and everyone else on the road. Unlike most teenagers, my daughter waited until she was 18 to get her driver’s license. But, that just made her older, not wiser, or any more experienced. By the time she was 20, she had already been in 2 car accidents that were her fault, and is now driving her 3rd vehicle she had to purchase. 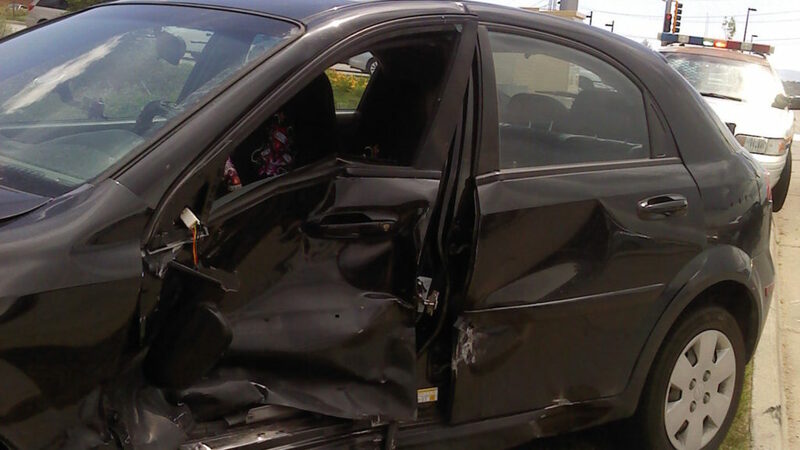 By the grace of God, she survived both of them, but the outcome could have been much worse. Above is an actual photo of her car. She was rushed to the nearest trauma center. Car accidents in general are the leading cause of deaths among teens, and accidents caused by teen drivers are also the #1 killer of teens, and have taken the lives of up to 6,000 per year. Teens between the ages of 16 and 19 years old, have fatal crash rates four times higher than older drivers. Current data on crashes involving 16-year-old drivers shows that if they have other teenagers in the car riding with them, they are twice as likely to cause a fatal crash as alcohol-impaired driving! The other passengers distract the inexperienced teen driver, when they need 100% of their focus to be on the road. The risks increase by three times while a teen is driving at night. Male drivers ages 15-19 crash 2 times more than females. And male high school students have been shown to have a higher rate than females, of rarely or never wearing seat belts. What else is causing the deaths in teen driving accidents? Speeding, lack of use of seat belts, peer pressure, and cell phone usage while driving. Did you know? Talking on a cell phone can double the likelihood of an accident and can slow a young driver’s reaction time to that of a 70-year-old. Where are these teenagers learning how to drive? Their parents! If you think your teen isn’t learning from YOUR driving habits, think again! Set rules, limits and restrictions for your teen driver, and stress the importance of safety. Teach the importance of wearing a seat belt at ALL times. Don’t just tell them what to do, tell them why you are saying it. Give statistics and examples. You don’t want your teen be one of the many that thinks “it won’t happen to me”. Set a good driving example! Let’s help keep more of our teens alive!